Selected by Vegas in the 2nd round, towering defenseman Nicolas Hague immediately made his presence known during the Knights' rookie camp last fall. He carried that momentum back to the OHL this past season, leading the Mississauga Steelheads in scoring with 78 points in 67 games (his 35 goals led all OHL defenseman). 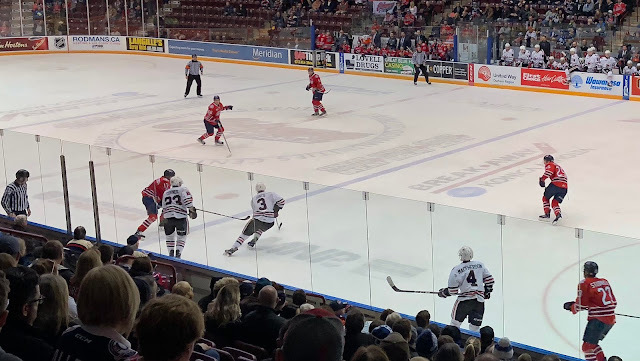 The team would finish seventh in the Eastern Conference, drawing a tough first-round matchup against the Barrie Colts - though the Steelheads jumped out to a 2-1 series lead as we arrived in Mississauga for Game 4. As mentioned, Hague can't help but stand out amongst his peers due to his 6'6" frame, and he served as a calming presence on the backend as Barrie came out with immense pressure in a must-win game. I was instantly impressed with Hague's defensive awareness and poise with the puck - he consistently used his long reach to keep players outside, and utilized his size to clear the crease in front of his goaltender. The final weapon in his arsenal is his booming shot: those 35 goals didn't come out of nowhere, as Hague has an absolute cannon from the point, which I saw on display several times throughout this game. He would not get on the score sheet in Game 4, but his steady play did help lead the Steelheads to comeback from a two-goal deficit and force overtime (though the Colts would win in the first minute of the extra period). Mississauga would be eliminated in six games, which allowed Vegas to reassign Hague to the AHL's Chicago Wolves for the rest of their season. He would make his professional debut on April 7, notching an assist in the first period of Chicago's 5-1 win over Milwaukee, which helped the Wolves clinch a playoff spot. Since he turns 20 before the end of this year, Hague will be eligible to play in the AHL at the start of next season, which should provide him with excellent development time moving forward. We're not supposed to expect much from 7th round picks, but Ben Jones is making the Vegas scouting staff look great for potentially finding a diamond in the rough. After spending rookie camp in mostly a fourth-line checking role, Jones returned to the OHL and had a breakout season with the Niagara IceDogs: his 79 points were third on the team, while the IceDogs entered the playoffs on a seven-game winning streak and were set to face the Oshawa Generals in the first round. After impressive wins at home in the first two games, the IceDogs traveled to Oshawa for the pivotal Game 3 - we would be in attendance for this game, and so were a fair amount of visiting fans. 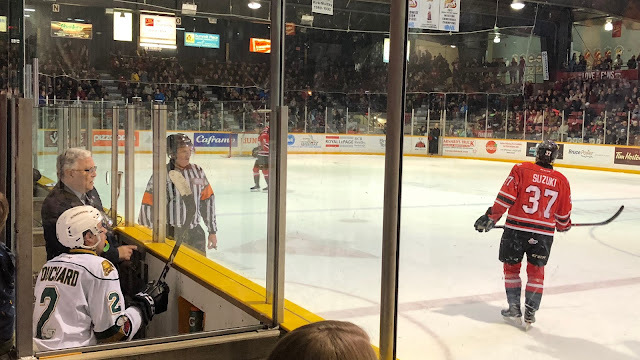 It would be a hard-fought contest, and Jones stood at the forefront, matching up against Oshawa's top line and taking most of the important face-offs. The Generals would break a 1-1 tie halfway through the second period, before extending their lead in the third and skating away with a 6-2 victory. It would be their only win in the series, while Jones ended up finishing with 5 points in 5 games. The question for Jones going forward: where will he slot in? He's proven that he can provide leadership and solid defensive play in the bottom-six, and also significant offense to play amongst scoring forwards - thankfully, he'll have another year in the OHL to fine-tune his game so we should get a better idea of his future role with the team. Suzuki, Hague and Jones all finished in the top-20 in OHL scoring this season, and each was an alternate captain with their team - they all play a balanced game and should get plenty of time to develop along the way. I'm not sure what the future holds for each of these three prospects, I just know that it's bright. At the start of the month, I looked pretty smart: Vegas would go 4-4 in the first eight games, including an ugly shootout win over the lowly Buffalo Sabres and an embarrassing 8-3 home loss to New Jersey. But the team rebounded in the final two weeks of March, going 5-1-2 in the remaining eight games to wrap up the Pacific Division. I had a hunch it might be a tough month, but the team looked focused and outdid my pessimistic prediction. I was skeptical of this trade at the time, but I wanted to give GM George McPhee the benefit of the doubt - this was a chance for Tatar to prove his worth, and did I ever guess wrong with this bold assumption! In 16 games, Tatar finished with a measly 3 goals and 2 assists, along with a dismal -5 rating for the month. I'm sure better days are ahead, but this was not the best showcase for the team's high-profile trade deadline acquisition. 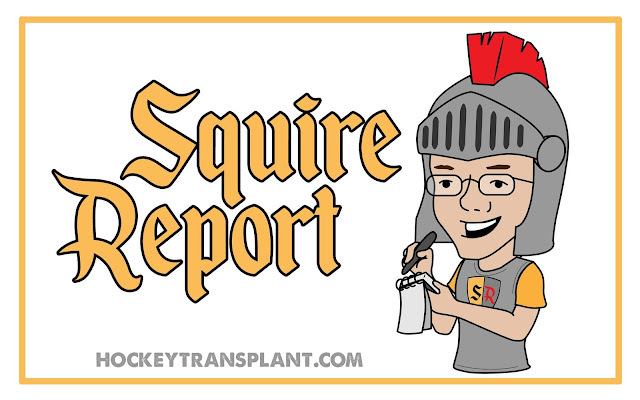 With the playoffs on the horizon and the Knights rolling toward a division title, I thought it would be the perfect time for McPhee to reward one of the key contributors who was playing with an expiring contract. It was not meant to be, and now the likes of David Perron and James Neal have to wonder if their playoff performance will be a factor in receiving a new deal to stay in Vegas. Like their NHL affiliate, I believe the Wolves will also enter the playoffs with a division title under their belt. Chicago has four games to go, while carrying a one-point lead in the Central over Manitoba and Grand Rapids, who each have three games remaining. With Nic Hague looking to prove himself at the professional level, along with the veteran presence of Jason Garrison and others, I think the team will finish the season on a hot streak and continue their winning ways into the postseason. The Stanley Cup Playoffs are a beast like no other: with coaches trying to outwit each other, and the increased physical play taking its toll on each player, we tend to see fluctuating rosters from time to time. As such, I would not be surprised if the young goaltender will spell Fleury for a night and get his first playoff start - this could be due to an injury or inconsistency from the veteran starter, or just a way to "shake things up" and motivate the team. No matter what, I expect the Knights to play strong in front of whichever goalie leads them out onto the ice each night. I struggled with this prediction: I usually try to be positive, but I fear a matchup with this opponent more than I would have with any other team. The Kings have the flexibility to play a fast skating game OR a heavy grinding style that is common in the playoffs - and their back-to-back victories over Vegas at the end of February show that they're ready to impose their will onto the expansion club. It's been a magical first season and I know that it will be considered a success regardless of any potential failure in the playoffs, but I think it could be a tough series against a battle-tested group. Here's hoping I'm wrong, of course!